Wow, those are wonderful questions! I'll do a quickie response and then give it some more thought. What makes this space alive for me (even now in the beta stage) are all the possibiities for "wandering around" in a fun way--just like we go wandering around among ideas in a Cafe conversation and then begin to see what the patterns might me. I also love that I can be notified when something interesting that's related to a conversation I care about (like this one) comes into my mailbox so I can hop back into whatever round of the conversation is unfolding. I liked being able to invite friends in because the World Cafe, as you know, has co-evolved through friendship and I think friends telling friends is a powerful way for these ideas to spread. This platform of connectivity has the potential to truly enable the "magic in the middle" to reveal itself...with people participating simultaneously in different conversations where cross-pollination can occur. Those are initial thoughts....more to come. What do others think? By the way, I don't know how to add tags to a post...but I think you might want to add some tags like--on-line community building, on-line collaboration. I agree that the World Cafe has a unique opportunity here. One of the reasons is that as World Cafe practitioners we already know how to build a culture in which deep listening and inquiry can occur; we have the ability to hold space and invite diversity of thought; we've cultivated an awareness of what it takes to offer "hospitable space". The opportunity I see is to bring these same capacities to our online conversations. I see the opportunity to create the "safe space" here that we share in our World Café circles, a place where we can explore freely in an atmosphere of trust and appreciation. Part of what makes this space alive and full of meaning for me is that people like you ask questions like these. Having the opportunity to explore questions that truly matter to me with people I am stimulated and informed by is a blessing. What about a delicious colombian coffee cup? I think definitely yes to #6 as well - when we get a conversation going with a few people and some real energy moving there is definitely an opportunity to listen together "into the whole" and begin to share our insights on that "meta" level. Perhaps it's a question of whether we can do something "together" without being in the same time and place ... I think it's possible ... Let's try! As far as #7 - you're right, doodling isn't that easy to do online :-) but we can upload our doodles and share them, can't we? And perhaps our photos and videos are doodles on some level as well. How about "Why Not?" to all of our current No and Maybe items. I started experimenting with Twitter, Flickr, Skype and Netvibes last year for a Virtual World Cafe mashup. Netvibes is the aggregator into which the RSS from multiple Twitter accounts for "table" groups would feed. With digital photos or images of collaborative whiteboard drawings and doodles fed via email into one or more Flickr accounts, you could have real time interaction. Skype conference calls for each table group would give you audio and text chat. I've attached an image that a friend created of how this would be blended with F2F for a large scale approach. What do you think? Your message is a perfect example of what would entice me to keep returning to this site. That is, it invites introspection. There is such a sense of connectedness and oneness here that begs one's "highest" input. I show up to "be in cafe" with an acute awareness of the unfoldment that will take place both within my Self and within the whole community as a result of my being here. Your questions have really left me with lots to think about, and that is what will keep beckoning me back. It is the collective intention of TWC to want to know what's on my mind. Reading this and Ulrich Soeders Conversation about leadership and dialogue I have the feeling that both conversations deal with the question: What holds communities together, what is the glue of communities. In this case here it is,: what's the glue of an online community, of this community. What makes me come back? I have the opportunity to connect with people around topics that matter to me. It is a space, where we can practice resonance. Which questions resonate to whom? For me it's very often the stories which are shared, that nourish me, that attracted me so much to the WC community. And the creativity potential, doodeling, colours, pictures...using differnt areas of our consiousness to rediscover resonances and thus reinvent our future. We are inviting other people to cocreate a shared picture of the future we seek to create. 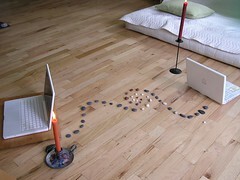 I love the picture of the two laptops, two candles being connected through a way, line, made out of stones. What is it about the picture that makes you think computers are INSTEAD of "real" life? For me, since it is a fact that more and more of us are by necessity communicating about real issues and cultivating real relationships online, for real reasons, I want those communications to be as heart and soul-connected as they can possibly be. I want them to be connected to the natural world, and to our bodies as well as our minds. So the photo really resonates deeply with me. It's never instead of, and always in addition to. Ashley, you pose an interesting question. Sustaining an online conversation is difficult. First the question must matter. And then participants must have enough passion around the question to continue to talk and share. People cannot feel ignored as they will drop off. And follow on questions may be important. I am drawn in and at the same time perplexed by online conversations. I have a hard time staying connected. I lose interest quickly particularly if the forum ends up being a soap box rather than a conversation. Difficult to create I think. I will keep coming back because my practice is conversation and I have a strong emotional, intellectual, spiritual, and application tie to TWC. Thank you for your question.